Where do those who write about new music find out about their new music? 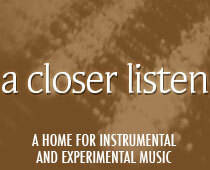 A Closer Listen is one of a host of websites whose existence can best be described as symbiotic. We each have our own private connections and submissions, but often the best way to expand our own horizons is to check out what our friends are doing. We don’t view each other as being in competition, but in complement. Each of us can cover a fraction, but together we approach the whole. For a fuller picture of the modern instrumental world, we recommend these other sites as well. Note: the above photo represents the Split Decision Breakfast at the International House of Pancakes ~ a great metaphor for this page! And of course, it includes links. Fluid Radio is the gold standard of music sites, excelling in multiple areas: timely reviews, comprehensive coverage, speedy announcements, exclusive mixes, insightful interviews, a radio station, a store, and an amazing digital magazine. Dan Crossley has also become an exceptionally fine photographer over the years, and his photos provide a personal touch that is immediately endearing. But perhaps Fluid Radio’s finest feature is its positive nature ~ something we aim to emulate at A Closer Listen. For coverage in the areas of ambient and modern composition, there’s no better place to turn, which is why more than any other site, Fluid Radio is worth checking every day. Sure, the writers of The Wire tend to be over-educated and have a tendency to send us searching through our online dictionaries, but this simply means that they know what they’re doing. The print version is still a favorite of many, but the online version adds more content and quicker news. Exclusive CD and digital compilations add to the allure. Those who enjoy improvised and experimental music should subscribe immediately. Echoes and Dust has become our go-to site for coverage of post-rock and post-metal. A large number of instrumental releases are featured on a regular basis, and frequently find their premieres on the home page. The site has a large and well-informed staff who are clearly very excited about the music they hear. Recommendations playlists are constantly updated, allowing readers to keep track of the best music year-to-date as it is released. Textura initially offered an amazingly dense monthly email, including reviews, interviews, videos, downloads and more. In recent years, the site has cut the wait time to nearly zero, and become a frequently updated source of new material. While their specialties are modern composition and jazz, they have an enormous reach that also includes intelligent electronic music and the outlying rock set. Stationary Travels is a relatively new site that has made a great impact in a short period of time. A sister WordPress site, Stationary Travels has established a wonderful relationship with Russell Sherwood Photography, which is responsible for the beautiful images. The site focuses on the calm end of instrumental music; as the editor writes, “Whether you are seeking inspiration & energy, peace & relaxation, or just something new and beautiful, hopefully you will find it here.” We love this approach and have been greatly enjoying the reviews, previews, playlists and cloudcasts. If you’re in need of rejuvenation, this is the place to go. Very few music magazines survived the transition to the digital age, but XLR8R is one of them. We’ve been reading them for decades. Those interested in electronic music will be overjoyed to discover an array of features: not only reviews, but copious festival coverage and even a section on gear. An active Soundcloud page includes frequent exclusives ~ mixes, preview tracks and enough to keep one’s iPod busy for days. While we miss the classic hard copies, we have to admit that the digital incarnation is even better. If we bought every release that Boomkat recommended, we’d be broke. But the ability to listen to sound snippets of nearly everything before buying is a welcome bonus, as is the fact that so many of Boomkat’s offerings are also available as downloads. While many fields are covered, Boomkat excels in techno, house, grime, minimal and other electronic beat music. New releases appear every day, but the largest list appears every Thursday. Fair warning: exclusives tend to go fast. Norman Records shares some of the same territory as Boomkat, but offers a wider array of rock, post-rock, progressive and psychedelic releases. The key appeal of the site is its colorful array of personalities, who all chip in on reviews. Informative emails highlight the top sellers and adds, but those who want to learn about new music before that are directed to the site’s constantly-updated just-in and pre-order pages. Periodic best-of lists and wrap-ups add to the appeal. Another bonus: when stocks are low, they’ll let you know! Once upon a time, Forced Exposure was a charming punk ‘zine. While the ‘zine may be gone, the dedication to excellent new music continues. Today, Forced Exposure is both a label specializing in experimental and vintage music, and a dependable distributor of multi-genre music. U.S. customers will find that it can be much cheaper (and faster) to order from Forced Exposure than to pay overseas shipping costs. An added treat: often FE scores exclusive snippets of upcoming releases, making the purchase even more care-free! We send our love to all of these sites and hope that you will too!